HEBRIDES RANGE, Scotland, Oct. 17, 2017 /PRNewswire/ -- A Raytheon (NYSE: RTN)-built Standard Missile-3 intercepted a medium-range ballistic missile target at sea as part of a multinational operational exercise off the coast of Scotland. The NATO-led exercise, Formidable Shield 17, was an integrated air and missile defense exercise simulating real-life threat scenarios. 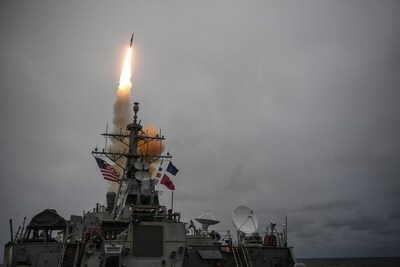 The event, supported by the U.S. Missile Defense Agency and U.S. Navy, was designed to evaluate the ability of allied navies' ballistic missile and air warfare defenses to work together quickly and effectively to defeat incoming threats. In addition to the SM-3 intercept, Standard Missile-2 and Evolved Seasparrow Missile conducted simulated target engagements of cruise missiles. "Real-world events demand real-world testing," said Dr. Taylor W. Lawrence, Raytheon Missile Systems president. "Strong cooperation between allied nations and industry helps ensure we are ready to defeat complex threats around the world." Raytheon's innovative and trusted solutions are designed to protect the U.S. and its allies from ever-advancing threats. Canada, France, Germany, Italy, the Netherlands, Spain, the United Kingdom, and the United States were among the NATO nations that participated in Formidable Shield. The exercise built upon a previous At Sea Demonstration in 2015, with a focus on real-world operations. The SM-3 interceptor is deployed at sea as part of the U.S. contribution to Europe's ballistic missile defense. The first land-based SM-3 site became fully operational in Romania in 2016, and the Poland site is expected to be in service next year.